I want these Marx Brothers edits to feel like nothing is missing (or nothing that you will miss anyway! ), just pure comedy magic. With 'Love Happy', hopefully I've turned a somewhat painful mess into something rather enjoyable and more up to the usual high standard of The Marx Brothers. Some history... 'Love Happy' was the last film the Brothers did and it was also perhaps the weakest. Originally conceived as a Harpo solo film, Groucho and Chico were added at a late stage in an effort to raise money to clear Chico's gambling debts. It is quite obvious as their characters feel stitched on to the plot as an after thought. However 'Love Happy' contains some of Harpo's funniest and most creative work and is a treat for fans of his silent comedy (Groucho fast-talking-dialogue fans get short changed though). A second problem comes down to the production running out of money. So often the film felt disjointed and missing pieces somehow. To raise funds a new ending was concieved featuring a chase across a series of advertising billboards. Luckily Harpo turns what could have been a cheap marketing ploy into a superb showcase of his personna's superhuman/cartoon-like comedic abilities. But it feels very stitched on and after it's over the film just kinda ends with a sign off from Groucho. As always my intention was to remove nothing of the brothers and streamline everything else. However with 'Love Happy' I did have to remove 30 seconds of Harpo that was featured at the end of a musical number that I've cut. Also despite the many technical improvements, there are still a few bad jumpcuts and continuity errors that could not possibly be fixed. 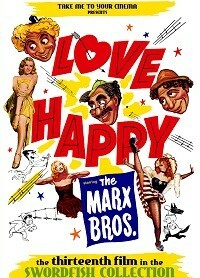 Love Happy is the worst Marx Brothers movie (The Story of Mankind doesn't count), but it's still pretty good, more so if you view it as a "Harpo Marx movie". A lot to like here, even if it's more of a "smile throughout" film than a laugh-out-loud one like most of the Brothers' filmography. TM2YC does a pretty good job in eliminating pointless, fun-stopping filler, yet I would have left "Who Stole the Jam" in, not only because it's a pity to lose any footage of the Brothers but because its removal creates a continuity error: one moment Harpo is enjoying a nice lunch with Maggie, the next he's running up the aisles for no apparent reason. I won't miss any of the other removed scenes, though. Editing itself is well done, other than a stray audio bit from the removed Throckmorton torture. One of the "agh's" happens during the dissolve in low volume and calls distracting attention to itself as digitally edited. The rest has nothing to fault, and the technical audio/video quality is fine.